Kyrie Irving has elevated his game to a new level of elite. He’s the unquestioned leader of the best team in the Eastern Conference. He’s as clutch as they come. Oh, and he’s capable of getting saucy on your favorite squad night in and night out — mask on, or mask off. All since the trade from the Cleveland Cavaliers to the Boston Celtics. These new heights from the NBA champion and four-time All-Star point guard are now complemented by a new and truly cutting-edge sneaker. Three years after presenting Irving with his first signature shoe, the Kyrie 1, Nike debuts the Kyrie 4 on Dec. 16 with the drop of a limited “Confetti” colorway, before the widespread release of the shoe on Dec. 20 in black-and-white. Each pair retails at $120. 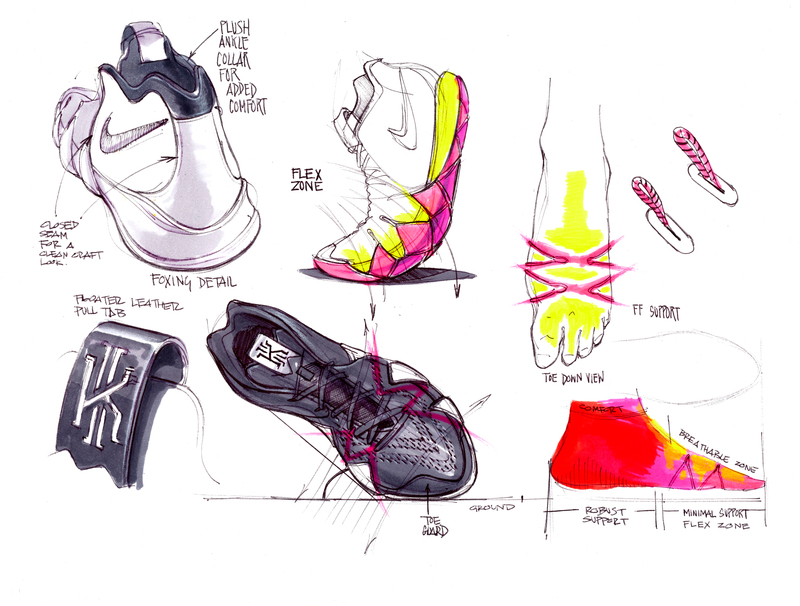 Although Nike Basketball design director Leo Chang crafted the first three installments of the Kyrie signature line, this time the company commissioned senior footwear designer Benjamin Nethongkome, who began at Nike as an intern in 2007. He previously worked on Kobe Bryant’s Mentality 2 and Mamba Rage, as well as Lebron James’ Zoom Witness 1. While the Kyrie 2 and 3 were created to enhance Irving’s “intense banking and cutting,” the design of the Kyrie 4 is geared toward making the shoe quicker and more responsive. In the Kyrie 4, Irving’s new designer utilized an innovative “longitudinal flex groove” on the bottom of the outsole to stabilize the movement of the point guard, whose cuts have transformed him into the most feared dribbler and driver in the league. Other updates to the shoe include a softer underfoot with more cushion, suede finishes and a refined heel shape, vamp and toe tip. Before the drop of the Nike Kyrie 4, The Undefeated caught up with Nethongkome, who spoke about how he landed the gig, his relationship with Irving — and that moment during the design process when everything clicked. How did you get the assignment to work on the Kyrie 4? Did you consult Leo during your design process of crafting the Kyrie 4, or did he let you do your own thing? A little bit of both. He is like a mentor figure, so he was very involved in the beginning, considering he was part of the Kyrie initially. But it was a smooth transition from him to me. But he was definitely overseeing the project. What do you remember from meeting Kyrie for the first time, and what type of a guy is he when it comes to sneakers? Luckily, I met him right after the Olympics. At that point, he was 24, just won a title with the Cavs, just won a gold medal, and he was in good spirit. He was extremely happy to visit us designers. That was the vibe I got, his aura. You could feel his mood in the room; it was so positive, he was so excited. We used that, and it fueled me to make some dope product for him. … At the same time, he was still elevating his game and he was never content and complacent, so we kept doing that as well: refining our shoes for him and fine-tuning every single detail like he’s fine-tuning his game. What exactly did Kyrie want out of his fourth shoe? Kyrie always challenges us as we get into design. He always goes back to this question: ‘Is this shoe going to make me better?’ We focused on performance. A high-performing basketball shoe, that’s what this is. Every little detail, the deciding factor was will it make Kyrie better? And it wasn’t like we designed something and put it out on the market. We validated it with our athletes, our wear-testers and Kyrie himself. The response from him has been tremendous, like, ‘Yo, this is probably one of the best shoes I’ve ever put on in my life.’ Having the shoe feeling more responsive, being able to bank easier, those are the kinds of things we really improved on, and it’s made a difference. It’s noticeable. 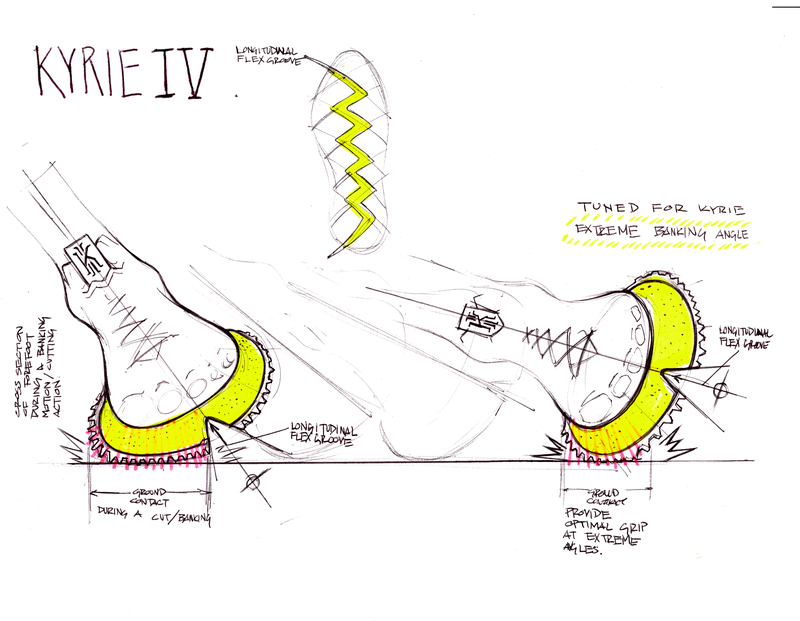 What’s your most vivid memory from the design process of the Kyrie 4? 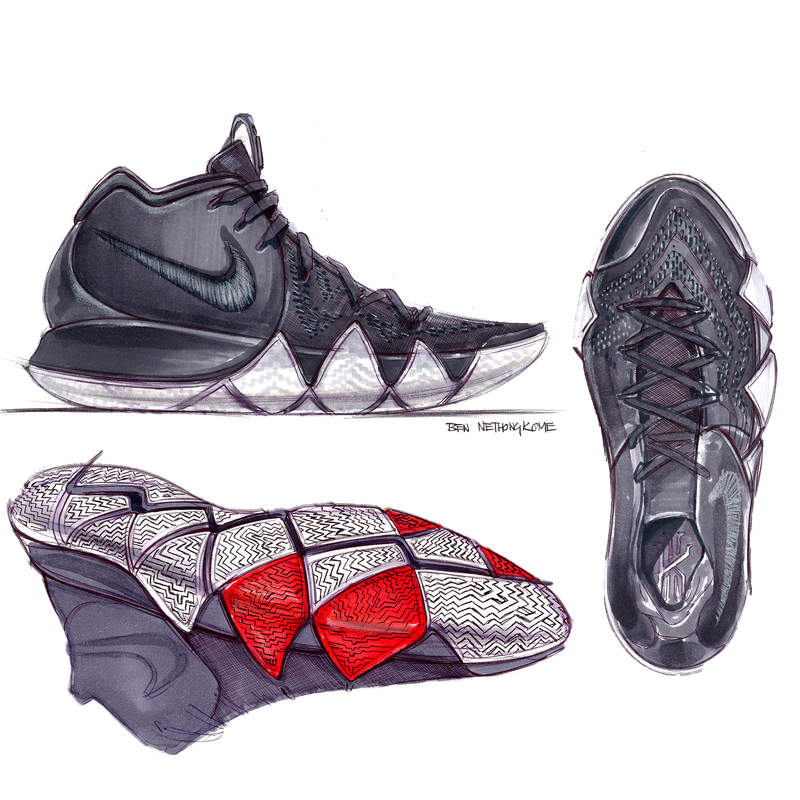 The best ‘aha!’ moment was we went through several samples and finally showed Kyrie one where he goes, ‘This is it.’ That was the best … it was like, ‘We’re on track.’ This was a moment of eureka, where we knew how we were going to proceed and continue to refine this shoe. When exactly in the process did this unfold? I would say a little later in the process. It was right before the playoffs last year. We had a chance to meet him at Miami. He had a game against Miami that day. It was a dope moment where we all, unanimously, go, ‘Yup … this is it.’ Also, when it was all said and done, I had a chance to sit down with him like, ‘Yo … so how’s the 4?’ He was like, ‘Man …’ He was speechless. His response was genuine and definitely authentic. It showed that the shoe delivered on what he’d asked for. How would you compare working with Kyrie Irving on the 4 to working with Kobe Bryant on the Mentality 2 and Mamba Rage? It’s still designing shoes, but with completely different athletes. Kobe and Kyrie are similar in many ways but different in many ways. Just the level of attention you get with the Kyrie 4 vs. the Mentality is different. It doesn’t mean it’s easier or more difficult; it was just a different process altogether. What can players expect out of the Kyrie 4? People who love playing basketball will appreciate the way it feels. … It’s definitely going to take Kyrie into a new place. How motivating is it for you as a designer to work with Kyrie in the prime of his career, especially with a new team? It’s truly motivating when you see him out there giving it his all every night. He’s definitely carrying the Celtics, and you see the hard work he’s putting in off the court too, so that definitely inspired me and our creative to really push ourselves to make a better product. Do you hope to work with Kyrie again in the future? Yes [laughs] … the answer is yes.